Hailing from Portland, Oregon, Jeanie and Alex are absolutely thrilled to spend summer 2017 caring for and carrying on the Nearings’ legacy. Married on Cape Cod in 2016, as part of their ceremony Jeanie and Alex made a pact to maintain an adventurous and spontaneous spirit. The coast of Maine is calling! Jeanie Kirk, a would-be 14th-generation Cape Codder, is a writer, editor, curator, feminist, and environmentalist. Her life has been guided by an ethos and desire to “do good” – a complex and ever changing lens through which to view the world. Jeanie loves exploring the concept of intersectionality and is an avid, life-long learner of progressive movements. With a master’s degree from Columbia University focused on the significance of climate change’s impacts on sustainable development, Jeanie currently makes a living as a consultant for environmental and social justice organizations in Louisiana, the front line of sea level rise in the continental United States. Jeanie loves the ocean, really big trees, yoga, hiking, skiing, cooking, reading, swimming, and fresh flowers from Alex. Alex Page, was born in Santa Cruz, California and feels most at ease with the ocean at one side. Having studied English at Pitzer College, he pursued his love of travel through a Fulbright fellowship in Korea. Upon returning, he moved to San Francisco to work for environmental non-profits, ultimately leaving to attend the University of Oregon to earn a master’s degree in sustainable transportation planning. Alex grew up on a 2.5 acre urban jungle oasis, yet did not truly appreciate his mother’s green thumb until he began his own backyard organic gardening. Still a novice, he’s ready to test his skills on a larger, higher stakes garden. Alex loves biking, hiking, skiing, cooking, baking, gardening, and a cold glass of chocolate milk. 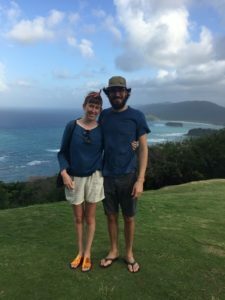 Together Jeanie and Alex are curious and compassionate listeners, eager to learn, and dedicated to supporting sustainable systems of living in partnership with the earth. They are so excited to spend the summer in Maine within the Nearings’ community and to support and encourage the Nearings’ legacy of environmental and economic justice. 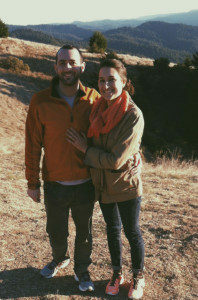 Playing outside, dancing, and good food brought Holli and Greg together. As the 2016 resident stewards, they look forward to learning from the Good Life Center community and working in rhythm with the land. Holli’s involvement in organic agriculture spans over a decade—including freelance writing, advocacy work, and owning and operating a farm business in Midcoast Maine. She is motivated by a deep interest in the stories of our collective agrarian heritage, and has chosen to explore tradition through her hands: learning to grow her own food by cultivating open-pollinated seeds and stewarding a flock of laying hens and a herd of dairy goats. An intrepid vegetarian cook, she further aimed to learn how to put by her larder for the year through cheese making, fermenting, cold-cellaring, canning, freezing, and drying. As she garnered experience, Holli sought to share it with her community. To this end, she has taught myriad workshops, from seed saving to wood-fired pizza baking. Holli has written extensively about organic agriculture, and acted as interim host for the Heritage Radio Network’s The Farm Report last winter. Greg was born in New Haven, Connecticut, the son of a nursery school teacher and a restaurant owner. Spending his early twenties in Vermont gave him a reassuring sense of wonder. Hitchhiking, climbing trees, double-digging gardens, and cooking community meals was an immersion in experimental self- sufficiency frameworks. Greg believes in the viability of use economies that are independent of the dominant market economy. He’s intrigued by economies in which food, shelter, and leisure are procured, enjoyed, and distributed through planned and earnest communal farming—instead of acquired in exchange for money. Sam and Claire have been best friends for nine years. 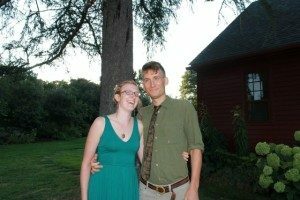 They were married last summer in New York’s beautiful Hudson Valley and can often be found exploring new places by bike, cooking with herbs from their garden, experimenting with fermentation and connecting with people at picnics in the park. They are excited to begin this new phase of life with open minds, a passion for simple living and their gregarious cat, Sabu. 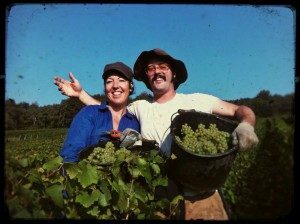 Claire Briguglio, from Bangor, Maine was raised in the Berkshire Mountains in Western Massachusetts where she spent long summer days seeding, weeding, harvesting and learning how to garden on a family friend’s farm. She took studio art and environmental studies at Macalester College, a liberal arts college in Minnesota (where she met Sam), and worked at the Horticultural Society of New York before coming on board as a Resident Steward at GLC. A visual artist, Claire’s work interprets nature through printmaking and photography. She is committed to education that incorporates healthy physical, mental and environmental practices with nature—whether via food, farming, art or leisure— thereby creating a more sustainable world. Sam Adels was born and raised in Philadelphia. A love and respect for the natural world was instilled in him by an environmentalist father and frequent camping trips; his earliest memory is of a family road trip and tour of national parks at age four. Sam studied history and the environment at Macalester College and has a masters degree in environmental education from New York University. Sam is committed to social and environmental justice and has devoted his professional life to experiential environmental education. Working for the National Park Service and various nonprofits he strives, through hands-on activities and inquiry-based field trips to connect youth with the natural world, sharing his passion to inspire future generations of eco-literate stewards our planet desperately needs.